For starters, instead of having a config file defining which feed to follow, I’ve turned it into a daemon that can be started and stopped, and to which new requests can be added to a stack (so that you can have multiple lists or feeds being followed). $ ~/social-notifier/application.rb add twitter search "#webchallenge"
Because this was my first experience with a real desktop application (except for a window-based calculator application over the Christmas holidays) I spent many hours away from the computer thinking about how it could be better written, learning and discovering the considerations that must be made of a desktop applications, and have made countless revisions. I’ve rewritten each facet of the application outside of the main process (the messenger, the notifier, and the requests) to behave as interfaces, thereby allowing a developer to add their own messenger, notifier, or request classes and extend the functionality of the system, without having to modify the existing classes or the main process whatsoever. The base notifier class can now be extended to use a notification system other than libnotify (even if that were to mean email or SMS notifications — not likely, I know). The TCP-based messenger (which allows interaction with the daemon process) can be switched with the existing file-based messenger, or replaced with some other system for communication between the processes (POSIX didn’t work out, but maybe it can be threatened harshly and thereby forced to work down the road). Different types of requests can be added, thereby allowing users to listen for more than just Twitter updates (e.g. Facebook, RSS/ATOM, email). (I’ve already started plans on adding Facebook requests, but recent changes to the Facebook API have slowed me down.) Since the stack doesn’t care what types of requests it has in it, it won’t make any difference what you put in it, so long as it has the required functions that the main process calls on each request. # require_relative ‘lib/request/facebook’ ## Not working yet. 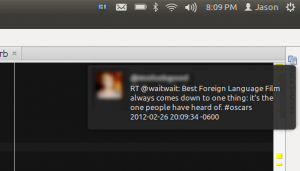 Granted, to some extent, Twitter, email, RSS, and Facebook notifiers already exist–even for Linux–but usually not in one application nor in one so light-weight (a few window-based applications can notify you of Twitter and/or Facebook updates, for example, and there have to be numerous RSS readers). The goal hasn’t been to write something to replace or to be better than such applications, but simply to write a program that I would actually use, and to hopefully learn from the experience. At any rate, the new version is available here. The README file has full instructions, and you’ll still need to get Twitter access and application tokens (see instructions in config-dist.rb) to retrieve Twitter status updates. Comments and criticism on the code and methodology would be greatly appreciated. UPDATE: source code link to point to github. I think I’ve determined my next move: Gmail feed for a given label, allowing users to flag certain emails with that given label, and then receive a notification when an email comes in matching that email. Just an idea, but we’ll see how it goes.